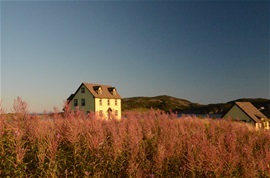 Perched atop a cliff on Trinity Harbour, COMMANDER'S KEEP VACATION HOME is the BEST in the BIGHT!! Sweeping views of Trinity and of the Harbour alike....with the Ocean beyond! 1. ON YOUR THIRD VISIT AT COMMANDER'S KEEP, FOR YOUR LOYALTY, WE WILL GIVE YOU ONE NIGHT'S ACCOMMODATION, COMPLIMENTARY FROM THE OWNERS. 2. IF YOU REFER A FRIEND WHO LATER STAYS WITH US, FOR YOUR LOYALTY. YOU WILL RECEIVE ONE FREE NIGHT'S ACCOMMODATION AT COMMANDER'S KEEP, ON YOUR NEXT STAY OF 7 DAYS OR LONGER. Over the years we have had several guests who taken advantage of their loyal patronage while enjoying the wonderful inside comforts and luxury, as well as the stunning vistas viewed from the deck of Commander's Keep!! COME & STAY... see for yourself the Location and Luxury experienced at "The Keep" up on the Nuddick in Trinity! !